Wait - - - read on - - - I will make you love okra! Yes, I'm aware okra can be a slimy mess when cooked, but we're not cooking it in this preparation, we're pickling it - yes, pickled okra is irresistible. And just look at this beautiful okra from Kimberton CSA at the Malvern Farmers Market - red okra! Simply beautiful! Okra is an edible seed pod. The tiny off-shoots at the base of the seed pod are petals. 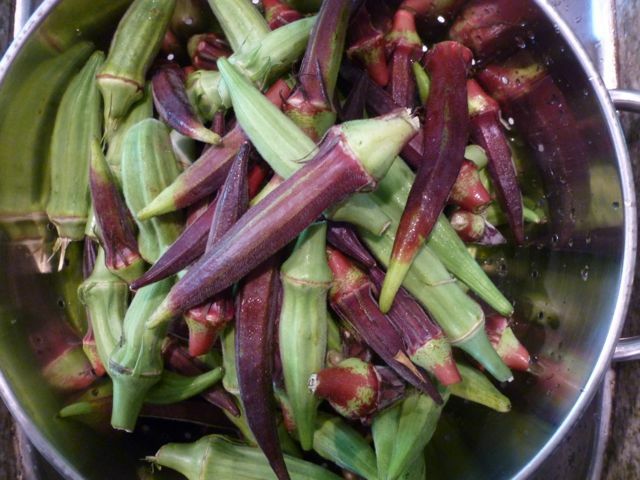 To prep the okra for the pickling, remove the petals and cut off the tip of the stem; wash to clean. Prepare the jars for canning according to the recipe, adding dried red chiles, bay leaves, garlic, dill seeds, coriander seeds, and black pepper corns for flavoring. Then pack in your okra. Add the pickling liquid and process according to the recipe. Aren't these beautiful, and so tasty, not a smitch of slime! They are super crunchy and disappear before you know it at dinner parties and picnics alike. Perfect paired with a Bloody Mary too! And okra is good for you too! High in fiber, vitamin C, folate, antioxidants and calcium!